There is no global way to change indentation or alignment of text. The formats of the individual elements, e.g., Title, Spanner, Caption, etc., must be individually modified to replace the ‘default’ alignment and indentation. 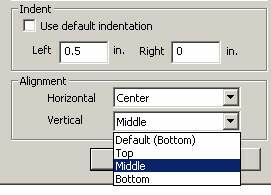 In both circumstances, specific or default formats, alignment and indentation are changed in the ‘Indent’ and ‘Alignment’ sections of the format menu. Indentation is given in inches (in.) or centimeters (cm.) depending upon the choice of Measurement System in the Format (Application) menu. Indentation affects where in the text box, the text starts (Left) and/or ends (Right). Alignment is the placement of text in the text box. The horizontal options are left(-justified), center, or right(-justified). Vertical choices (shown) are top, middle, and bottom.